One of the most important factors that drivers need to keep up with is automotive maintenance. Ensuring that their vehicle is in great shape is important for the benefit of their vehicle’s condition and performance. 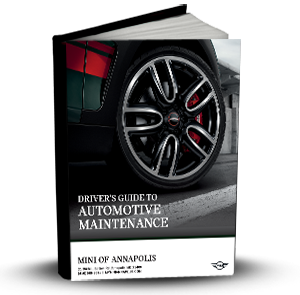 At MINI of Annapolis, we’re here to offer drivers a helpful resource in The Driver’s Guide to Automotive Maintenance. This eBook will cover the basics of automotive service and regular maintenance so you can get the most out of your vehicle. This free eBook will give you important tips to help you stay up on service and help you identify an issue that requires the help of a professional. Getting your copy of The Driver’s Guide to Automotive Maintenance is really easy. All you need to do is fill out and submit the form that’s on this page. You’ll then be ready to download your copy, so you can get started on learning the types of services that your vehicle needs performed. At MINI of Annapolis, we’re always happy to help drivers in Annapolis and Highland Beach through dedicated automotive services and informative resources about their vehicle.